1. Set oven to 180/gas mark 4. Roast bananas in skins for about 15mins until blackened and soft. 2. 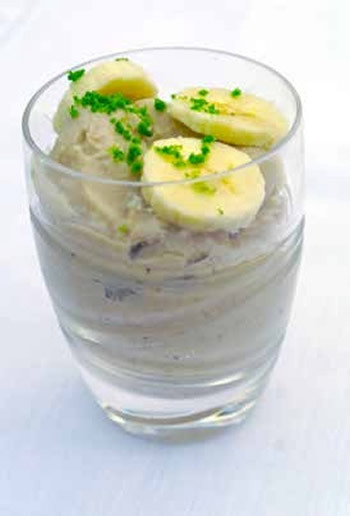 While still warm, slide banana flesh out of skins and mash with sugar in a bowl. Add salt and coconut milk. Puree mixture with a hand blender until completely smooth. 3. Churn in an ice cream machine or place the mixture in a lidded container in freezer. Give a good stir after 40 mins, then every 30 mins or so until the mixture is firm and smooth (may take up to 4 hours). For best results, use a large container which will speed up freezing. When ice cream is frozen, transfer it to a food processor and pulse for about 1min, until smooth. Scoop it all back into tub and return to freezer. 4. Before serving, allow to soften in fridge for 25 mins. Decorate with fresh coconut and lime zest or more banana. Especially good after a hot Thai green curry! Not only is it delicious, thick and creamy with the flavour of fresh coconut, but it will also help coconut farmers in Sri Lanka. By providing employee welfare support, educational development, support for marginalised people and the introduction of sustainable agricultural practices. By promoting energy conservation, waste management and organic agriculture. 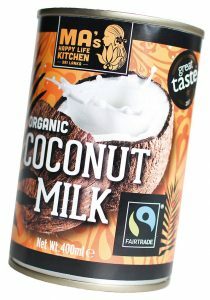 MA’s Award Winning Fairtrade Organic coconut milk from Sri Lanka is the only Fairtrade coconut milk currently available in the UK. Find out how JTS are supporting Fairtrade.